Morning gossip by Helene Buttling © 2015. Helene Buttling is a self taught artist working in pastels and acrylics. 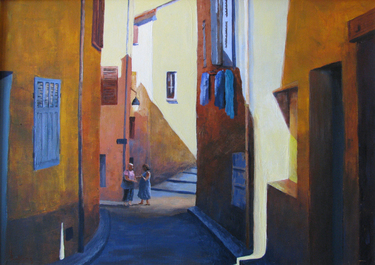 Her paintings often evoke a stillness, an intensity of shadows, a captured moment. She has exhibited in international salons in Normandy, St. Petersburgh, Krakov, Warsaw, Italy and has had solo exhibitions in galleries in South West France and Paris. She has a permanent exhibition of her work at her gallery/studio near Chalais where she has been teaching art for the last 15 years. You can find out more about her here, and follow her on Facebook. Mag and Sheila await the return of their Italian hairdresser Sergio who has nipped out the back for a smoke. Sheila: Hi Mag! Is there any sign of that fella coming back? Mag: Shur he only went out there a minute ago Sheila. Sheila: Wouldn’t you think he’d try one ‘o them new-fangled smoking machines, you know the electric ones, and be suckin’on it in here instead of keeping us waiting? Mag: He could I suppose. Have you tried one? Sheila: Shur why would I and I not smoking any more? Gave ‘em up forty years ago last November as you well know. Best day of my life bar the day I buried my mother-in-law, although the weather was bad that day too. Isn’t it just cat outside? My new hairdo will be destroyed, that is, if I ever reach the street. Is there any sign of that fella at all? Silence except for the drone of the hair dryers behind them. Sheila: You know, that fella’s like a woman, always on about hair and makeup and hand cream. I mean, did you ever hear of a man interested in minding his hands? Do you think he might be one of them gays? All them hairdressers are shur. Silence. Mag has drifted off to the hum of the dryers behind them. Sheila doesn’t notice. Sheila: He better be back soon or I’ll take myself off somewhere else. I hear that Sandra down High Street is only half the price and half the wait too if you ask me! Sheila: Mag? All the tables at the Château will be taken if he doesn’t get a move on. I mean, we pay good money and provide good conversation and news and here we are like two stupid auld wans. Wouldn’t he just get a move on? Just then, Sergio returns, reeking of tobacco smoke and aftershave. Mag wakes up from her slumber. Sheila cracks a wide smile as he reappears behind her. Sheila: Oh Sergio! We hardly noticed you were gone, did we Mag? Mag: No, no. I was resting my eyes for a moment and then you were back. Sheila: You’re a great hairdresser Sergio, no matter what they say. And you’ve such lovely hands!